Amazon.com description: Product Description: Emotions are an elemental part of life - they imbue our existence with meaning and purpose, and influence how we engage with the world around us. But we do not just feel our own emotions; we typically express them in the presence of other people. How do our emotional expressions affect others? Moving beyond the traditional intrapersonal perspective, this is the first book dedicated to exploring the pervasive interpersonal dynamics of emotions. 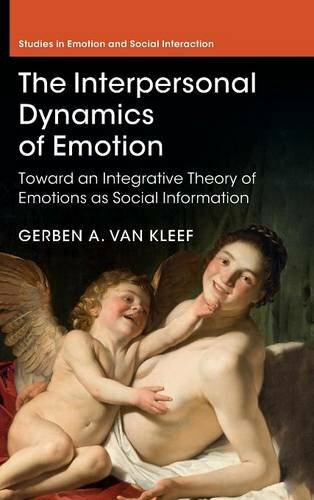 Integrating existing theory and research, van Kleef develops the Emotions as Social Information (EASI) theory, a groundbreaking comprehensive framework that explains how emotional expressions influence observers across all domains of life, from close relationships to group settings, conflict and negotiation, customer service, and leader-follower relations. His deeply social perspective sheds new light on the fundamental question of why we have emotions in the first place - the social influence emotions engender may very well constitute their raison d'Ãªtre. About: Emotions are an elemental part of life - they imbue our existence with meaning and purpose, and influence how we engage with the world around us.